Western snowy plovers, found nesting in Fort Stevens State Park, were listed as a threatened species in 1993. Three years ago, Fort Stevens State Park designated a half-mile portion of the beach as a "Western Snowy Plover Management Area" and invited the endangered birds to nest there. No snowy plovers took the park up on its offer. But this week snowy plover nests were spotted at Clatsop Spit — the first time since the 1980s that anyone has seen the birds there. 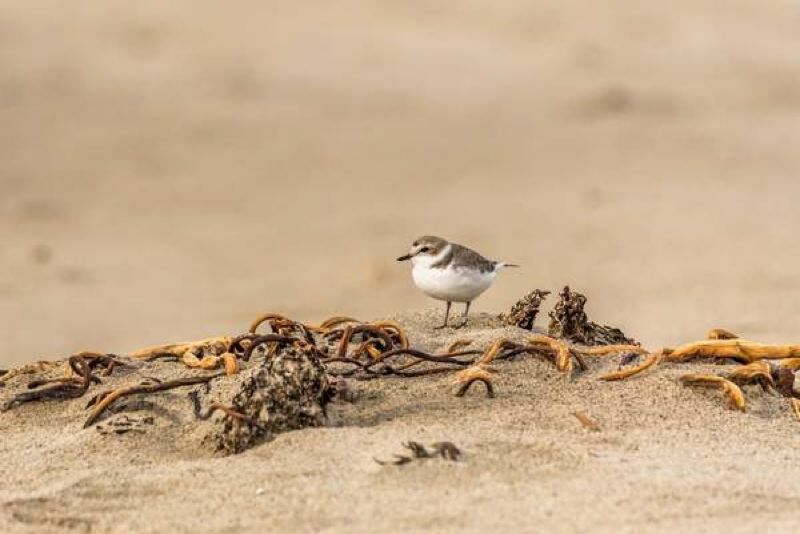 Vanessa Blackstone, a wildlife biologist with the Oregon Parks and Recreation Department, says the sighting is even more exciting because it connects the Western Washington state and Northern Oregon snowy plover populations. The possibility for this overlap was one big reason why the department originally picked the Clatsop Spit area, bordered by the Columbia River and the Pacific Ocean, as a management area. "Oregonians have helped plovers return to the North Coast, and Clatsop Spit is an important link between our Tillamook County birds and those that live in Washington," Blackstone said. "Plovers nesting at Fort Stevens is a huge step for species recovery and people who support a healthy environment. We can all be proud of this moment." So far, the state reports seeing one nesting pair with three eggs on the river side of Clatsop Spit. Such sightings prompt special precautions within the management area. Several activities are restricted, including dogs (even on a leash), vehicles, kites, drones, camping and fires. People walking along the beach are required to stay on wet-sand areas and keep to official trails. Signs on dry sand identify plover nesting areas. Snowy plovers nest in shallow sandy scrapes. Eggs and chicks are well-camouflaged and can be accidentally crushed by people or pets. Repeated disturbances that cause parent birds to flee the nest — permanently or temporarily — can also be lethal for eggs. Last year, the sighting of snowy plover nests and one successful hatchling marked a major success at Nehalem Bay State Park south of Manzanita in Tillamook County. That same year, three chicks also hatched at the Sitka Sedge Natural Area near Pacific City. The nests in 2017 were an important turning point for Oregon's conservation efforts in the northern part of the state. In 2015, the first nest since conservation began in earnest at Nehalem Bay failed. There is a chance that the male snowy plover nesting in the Clatsop Spit area now is the same one that successfully nested in Nehalem Bay last year. The bird carries a similar colored band. If it is the same bird, he likely bypassed Nehalem Bay this year because winter storms kicked up piles of driftwood onto the beach, eliminating good nesting habitat, Blackstone said. This year, there is evidence that a chick may have hatched at Sitka Sedge. There are no confirmed nests at all at Nehalem Bay yet. The habitat at Clatsop Spit isn't always guaranteed. "The river moves things around so much," Blackstone said. But down by the South Jetty, habitat happened to accumulate. The U.S. Army Corps of Engineers, which owns the land and leases it to State Parks for recreational use, plans to further develop that habitat as the agency goes about jetty repair work in the future. Western snowy plovers were listed as a threatened species in 1993. Sitka Sedge, Clatsop Spit and Nehalem Bay are just some of the snowy plover management areas the state oversees through a legal agreement between the parks department and the U.S. Fish and Wildlife Service. The Daily Astorian, available at dailyastorian.com, is part of EO Media, a news partner of the Pamplin Media Group.